Excited to try our new pint flavors? Here’s your opportunity! 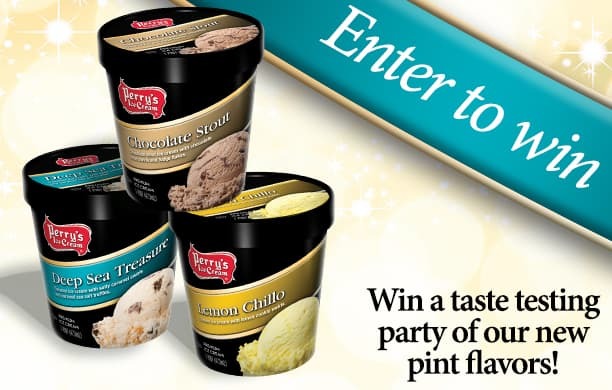 One lucky winner will win a taste testing party for their family and friends! Each day from April 11th-15th, we will post a clue about a different quart flavor on our social media sites. Guess the flavor correctly to be entered to win the taste testing party. One winner will be chosen randomly from all entries and announced on April 18th. Good luck! That’s a great idea Jeff!! We will let our research and development team know! Those are only sold at ice cream stands. We will let our team know you would like them in stores! Peck’s Markets in Sullivan County NY have replaced Perry’s ice cream with Hood ice cream I am very upset about this.Why isn’t Perry’s ice cream available at these locations any longer? I live in Manhattan and I never saw Perrys other than when I was in Westchester the other day. I saw Cherry Panda Paws and picked it up and drove back to the city that night. My wife, who is not really an ice cream eater, was fighting over the 1/2 gallon. It was crazy!! Cherry Panda Paws is now my favorite ice cream of all time. Bravo! Loved the Buffalo Bills sundae flavor. Didn’t see it in your flavor list. I hope it comes back! You ice cream is the absolutely BEST. THANK YOU! Iam a diabetic and i buy your sugar free ice cream. I spoke to my doctor said it’s ok. But i live upstate ny and the only favor they have is vanilla.and no sugar free in pints. Please let us have the choices like everyone else has.your ice cream out beats all the other brands that are sugar free. The Zero Visabilty flavor is so creamy and delicious! I know it’s a limited edition flavor, but this is one I would hate to see not available later on. My daughter loves it too.